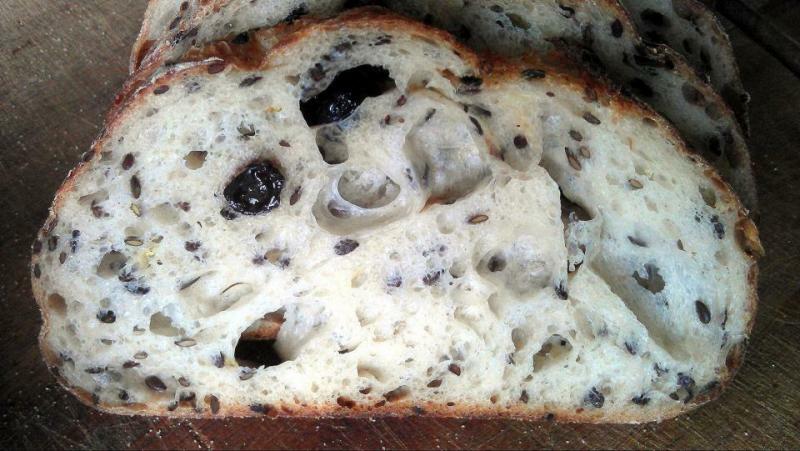 squeezing in time for bread making..
Black manuka raisin flaxseed light rye sourdough flavored with osmanthus flower tea. 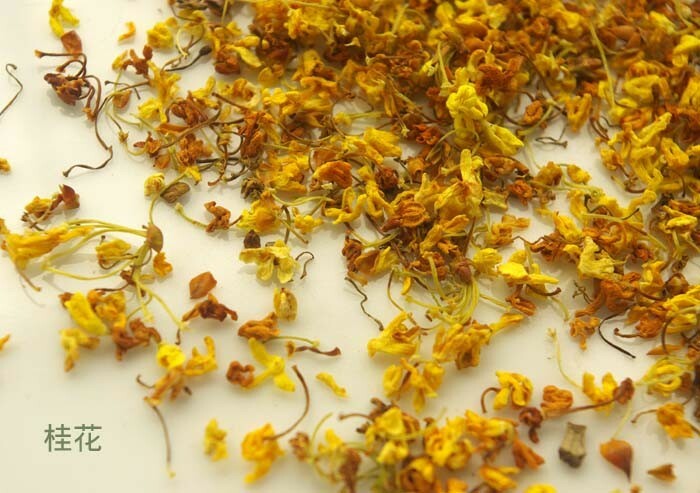 osmanthus flower tea, very fragrant. Was wondering, did the flower tea pull through and give off a noticeable presense? 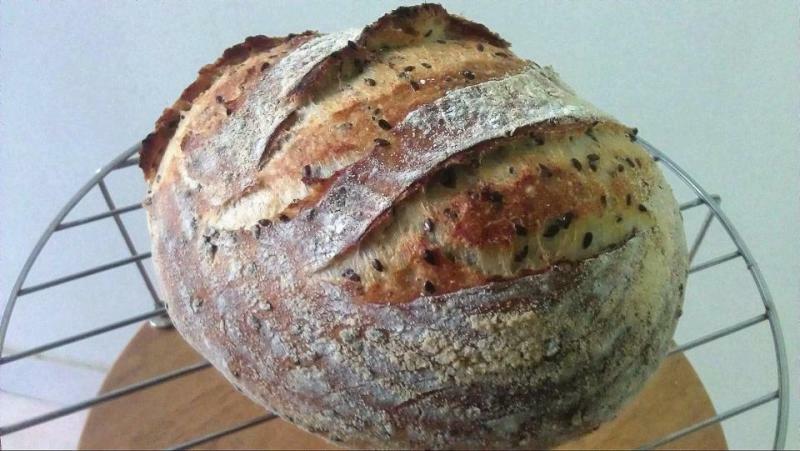 I've yet to use tea in my sourdough but have been thinking about it for ages. yes, it did give a noticeable presence. That bread is simply beautiful. You could make money selling that picture of your lunch. Gorgeous composition. Exquisite colors. 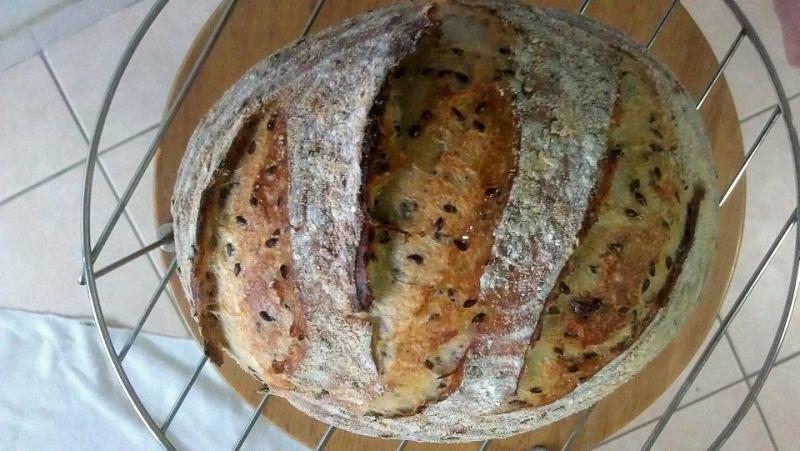 And of course, a beautiful bread. What a beautiful loaf and great pictures too! 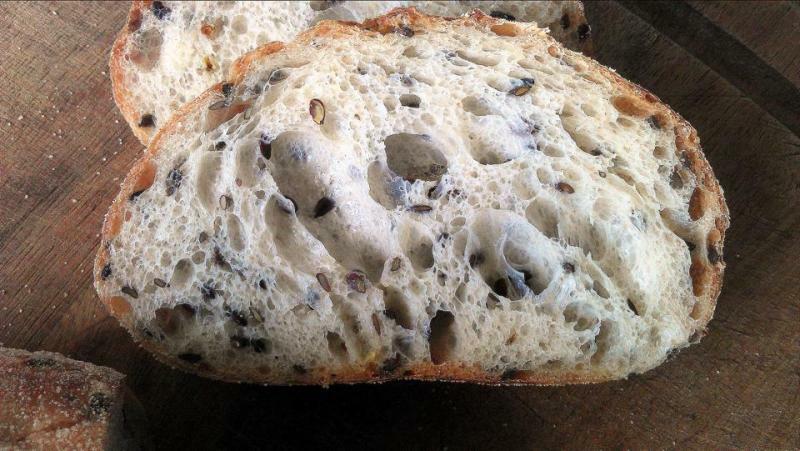 I love using flax seeds in my breads and have baked one using chai that my kids really liked too. I never would have thought of adding it as an ingredient if I hadn't read about here. 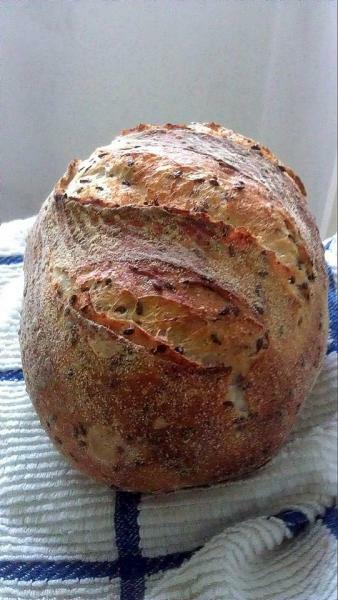 What inspired me to try it was a loaf like yours. 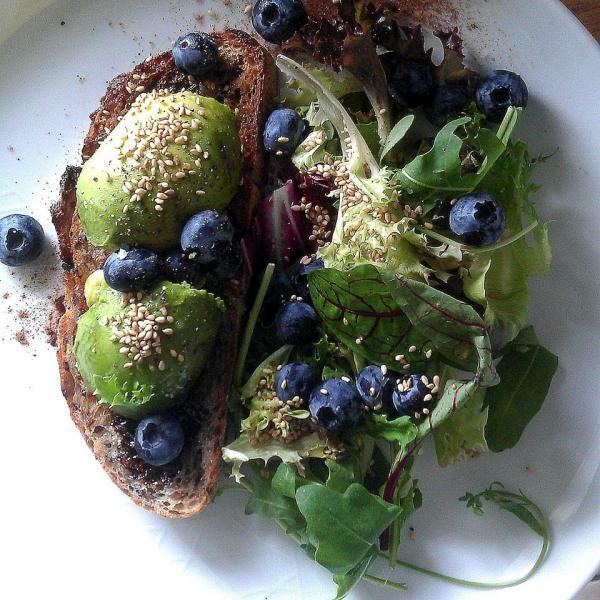 The bread is just breath takingly beautifu Evon! The lunch is delightful as well. So well baked, presented and photographed. I can never seem get the tea taste to come though but haven't tried this one. start in the evening, mix flour, water stater and flaxseed. autolysed for 40mins to 1 hour. then add salt. cover and do 2xSF each 40 mins. first SF add in drained manuka raisins and (a handful) dried osmanthus flower tea. covered overnight in room temperature or retard in the fridge if finishing up the next evening. next morning or evening, shape to desire shape. proof for 2 to 3 hours. (please check after 1 hour with finger test, proofing time may varies due to starter and room temp) baked in dutch oven preheated 450F for 20mins. uncovered for 10 or 15mins. p/s i did 3 medium boules for this formula. I want to just take the photo and eat it. Gorgeous loaf and beautiful photography. How inspiring. Just beautiful! 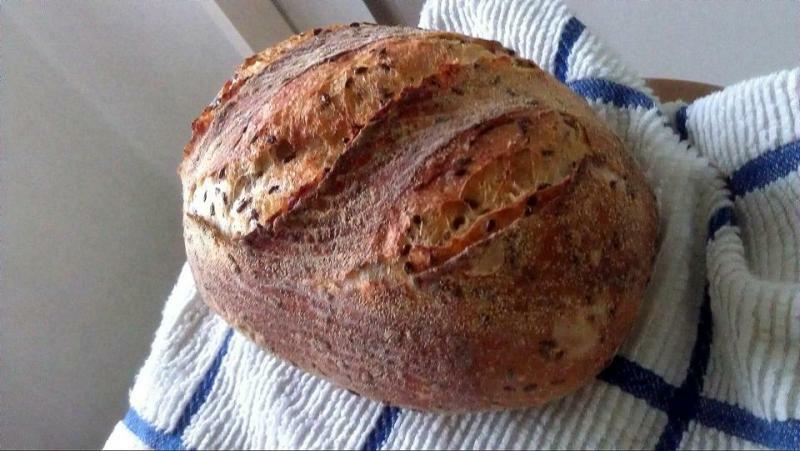 I'm supposed to be working and not looking at your gorgeous baked bread :). 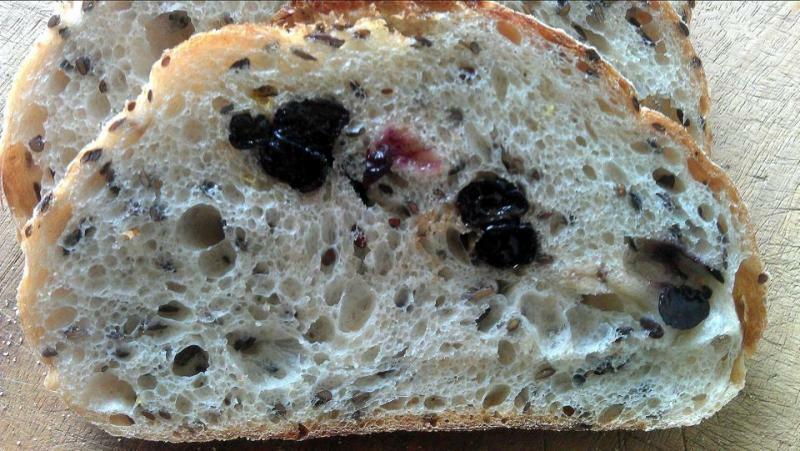 I recently made a bread with cherry tea but it did not really come through in the taste probably because I added too many other flavors. So what do those plump raisins taste like? those plump raisins tasted like flower! manuka raisins are not sugary sweet as the normal raisins. i like black grapes and raisins, they are not as sweet as the greens and red ones. slight bitter infact. yes, i try not to add too much other flovors in the bread. as you can see from my formula almost all white flour with a touch of rye. baking and photo's. I just want to reach in, touch, smell and taste it all. thank you all for your kind words. made me so proud of myself hehe.. and thanks to my little HTC sensation for those beautiful pictures! !